As a native of St. Louis, I thought I had done and seen it all when it came to going out and spending time with my significant other. Finding alternative ideas in and around the city seemed almost impossible until my eyes were opened to several spots positioned off the beaten path. Let your search for the perfect date end here. Listed below are eight great ways to paint the town red. Break the rules by skipping dinner and diving fork first into a delectable dessert at this posh pastry palace. As the recipient of a host of rave reviews and awards, Baileys’ Chocolate Bar is highly regarded for its spin on everyone’s childhood favorites in addition to a list of unconventional treats intended to cater to even the most mature palette. Stop by between the hours of 4 p.m. and 1 a.m. on Mondays through Saturdays or between 4 p.m. and midnight on Sundays to satisfy your sweet tooth and your date’s chocolate cravings. Interested in working side-by-side with your guy? Want to learn how to spice up both your favorite recipes and a date night or two? The Kitchen Conservatory, also known as “the premier kitchen store in St. Louis, Missouri for 28 years,” according to its website, is home to more than 800 different cooking classes that are “taught by the best chefs from the best restaurants.” Whether you choose an Asian, Italian or Cajun theme, you’ll be amazed with your plated results. 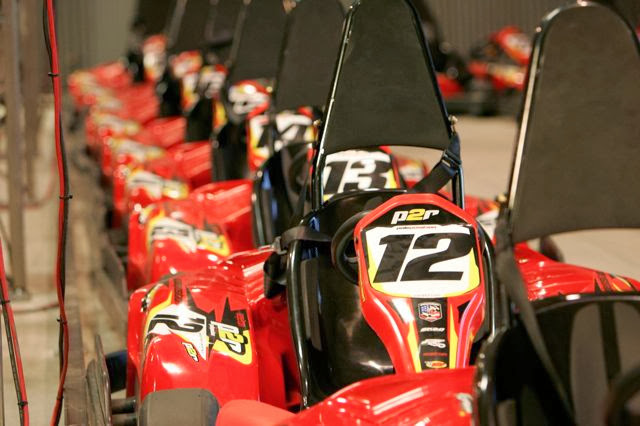 If you’ve got a real need for speed, Pole Position Raceway is your perfect destination. Join in with another couple during their weekend hours (11 a.m. until midnight on Fridays, 10 a.m. until midnight on Saturdays and 10 a.m. until 7 p.m. on Sundays) and enjoy a friendly go-kart competition on one of their indoor tracks. With the Raceway’s “Arrive & Drive” package, kart speeds reach up to 45 mph, so buckle up and hold on tight, for this one will have you driving laps of love around your one-man pit crew. “Relax, have fun, be creative,” and most importantly, get your craft on at the Painted Zebra! I’m positive that I’m not the only one who’s lacking in the artistic department, and to those who’ve also raised their hand to this fact, I’ve got great news: the attendants there are helpful and are happy to show you to a plethora of idea books, stencils, brushes and paint that will bring out the pottery proficiency in all of us. It gets even better! Every two weeks on Friday evenings, the Painted Zebra offers a 25 percent discount on studio time, which allows for individuals to discover their hidden potential talents as an artist for less. Located in St. Louis’ Grand Center arts district, Jazz at the Bistro is where many prefer to cozy up and listen to the smooth sounds and tasteful tunes of talented musicians. Reserve your seats to an upcoming show and receive the bonus of paying student fare with a valid ID. The Bistro recommends “arriving between 6-6:30 p.m. if you would like to be finished with dinner before the show starts.” But, if you prefer to dine after those times, “the Bistro does serve tables during the performances,” according to Jazz St. Louis’ website. Ditch picnicking, and instead, saddle up with your beau and take a horseback ride through the magnificent Pere Marquette State Park. Pere Marquette Stables leads groups down trails where local wildlife is plentiful and often seen, so prepare to witness the beauty of nature and all it entails. Although reservations are not required, they are recommended and accepted Wednesday through Monday during the months of May through October. Yee-haw! “Take a zip...it’s a trip,” exclaims Grafton Zipline Adventures on its website. If you’re not afraid of heights or are looking to finally face your fears, consider elevating your daytime plans to a higher, more extreme level. Guests will virtually fly safely atop tree-top canopies on nine ziplines during their 2-hour tour. After, replenish at the Aeries Restaurant and Winery located approximately 300 yards from the last stop. Sound’s like fun, right? Make sure to book your trip ahead of time as reservations are required.